The city is an almost unfathomable place to live from the outside looking in. But, for those that have lived in a big city, it is clear that there is something so mysteriously attractive about the chaotic beauty that seems to fall so perfectly in line as you fully begin to immerse yourself in the city culture. Bright lights, loud sounds, and strange smells overwhelm your every sense as you can feel adventure and freedom around every corner, and eventually, you call this feeling home. That all being said living in the city comes with its requirements. You need a special mode of transportation if you want to truly enjoy everything city life has to offer. This is where the Chevy vehicles available at your Chevy dealer in Albany, NY, come into play. Urban automotive needs are a lot different than that of any other area. Rural areas need durability and power to handle long distance driving, possible off-road capabilities and a wider variety of road types. Suburban areas and towns need SUVs for convenience, possibly long commutes and flexibility and close-quarters navigation. Cities, on the other hand, don’t require power or flexibility, they rarely have the same weather conditions to worry about, what they need is something a little more, well…little. Bigger is not always better as many would have you believe. In the city, you will find hordes of people walking or taking the subway in order to avoid the harsh traffic and limited parking. This is where investing in a compact vehicle will be your saving grace. Compact vehicles are amazingly easy to handle in any situation and will fit into even the trickiest of parking spots. Today many city parking garages will even have spots labeled compact specifically for these types of cars. When it comes to cities, it is best to combat with the compact. Luckily, you’ll find a vast selection of compact vehicles available at your local Chevy dealer. Living in or commuting to the city is not cheap, and owning your own vehicle is almost a luxury instead of a necessity. This is why if you do want a car in the city you will most often need one that is on the more affordable side. Luckily, many smaller cars that fit in well with the city lifestyle are usually on the cheaper side compared to bulky trucks and SUVs. At your local Chevy dealer you can easily find a Chevy car that will suit your budget. Unfortunately, cities are often known for their high levels of pollution due to the influx of people and the resources they use. This is why going green is one of the best things you can do, especially when it comes to your vehicle. Green cars will also save you a lot on fuel and maintenance in the long run, as well as preserve the longevity of your car. This is why you should always check the fuel economy of a vehicle before buying it, especially if you will be using it in a city area. Technology is more impressive than ever when it comes to automotive innovation. Busy city drivers will not want to go a day without staying connected with everything and everyone, and all Chevy vehicles have a specialized infotainment system just for that purpose alone. 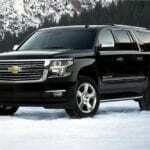 Your car and your phone will become one with Chevy’s MyLink system that connects directly with your Apple or Android smartphone to give you access to apps such as music, as well allowing you to easily send and receive texts and calls without your eyes ever leaving the road. You will also be able to charge your phone on the go so that you never have to worry about the horror of discovering that your battery is going to die. The city is fast pace, and you will need a car that can keep up with that. Here are some hand selected Chevy vehicle options that we believe would make the best city cars. The Chevy Spark is cheap and the smallest vehicle option in the Chevy lineup. It may seem like it is just some adorable mini-car, but it also offers sleek and modern styling, smooth handling, and the latest technology. The exterior color selection is also dazzling and unique so that customization will leave you with a truly unique vehicle. The Chevy Sonic is very similar to the Chevy Spark in that it has proven great things do come in small packages. Despite its size, the Chevy Sonic has a large personality with plenty of tech, style, and power to go around. The Chevy Sonic is truly a brilliantly designed model that is similar to the Spark, expect that it is bigger and offers a stronger performance. The Chevy Cruze is one of the favorites at Chevy due to its reasonable dimensions, high intellect, customizable stylishness, and proficient power. Overall, it is one of the most fun to drive cars on the market. A hybrid option is also up for grabs that will make being eco-friendly a breeze. There really isn’t enough praise in the world that could do the Cruze justice, and that is why you just need to test drive one for yourself to not just see, but to feel what it has to offer. The Chevy Volt is an electric car option that works amazingly for those that enjoy embracing the city life for all that it’s worth. It is clean and stylish with easy to handle performance capabilities. You will also find it to be on the more affordable side for an electric vehicle. The Chevy Bolt EV is another electric option for those that enjoy saying completely away from costly gas fuel. This is the first affordable all-electric car that will get you 238 miles on just one charge. The size is compact yet breathable, the style is sleek and modern, and the technology is brilliant and ready for anything. This is an ideal city car! Whether you commute to the city or live there, you should have a car that suits the needs of the city. Chevy Dealers in Albany, NY will have all you need in order to find that perfect Chevy city car at the perfect price point. So, when you’re ready to purchase your next Chevy, head over to a dependable local dealership!